This is based on a recipe from a Japanese Methodist Church cookbook, but started out as a 2-day, marinate-the-fish-in-the-fridge process. This is just far too many steps and if you are not Very Careful, your whole fridge will smell like miso and fish. I can tell you from personal experience that this is highly undesirable. This is one of the (very) few things that my mother-in-law actually requests I make for her. Whisk ingredients together. Coat fish and if possible, marinate for at least 30 minutes. Broil (preferred) skin side up, or grill. It is done when the fish flakes nicely and the miso coating is nicely browned. 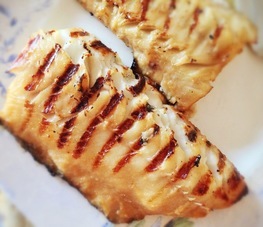 Grilling adds even deeper flavor and the fish still stays nice and moist. If you grill, the skin will slide off, so make sure you flip it only once. Toss away the koge (burnt) skin.